RENDER THEREFORE UNTO CAESAR THE THINGS THAT ARE CAESAR’S AND UNTO GOD THE THINGS THAT ARE GOD’S (MATTHEW 22:22) – PT 5 | My Blog Title is "THE UNVEIL PERSPECTIVE"
There is no hindrance of this prophecy (shown on “The Other Side of the Roman Denarius [Coin]”), which is already at work, seeing that the Church of the founders (early first century apostles) was already at stake. As “Imperial Rome” is now “Papal Rome” with a religious constitution given by they who had already rendered their glory unto the seat (throne) of Caesar, we concluded that the falling away had already passed, and he (Imperial Rome) who “letteth” is now out-of-the-way. Jerome, with intent, opposing what Porphyry said about the “little horn” in Daniel 7, agrees that this horn is the Antichrist. Actually, if the “little horn” in Daniel 7 represents the Antichrist, then the “little horn” in Daniel 8, also forms that power as well. “For the mystery of iniquity doth already work, only he who now letteth will let, until he be taken out of the way” (Thessalonians 2:7). Don’t be mistaken, the act of the “man of perdition” was long on the way, ever since the act (i.e. the plans sought against the Messiah) against the anointed ONE (Son of God). Christ, as a prophet, who speaks about the coin and the rendering unto Caesar, knew of the elders of the synagogue intention to trap and judge Him before Caesar. It was clear that these elders of the synagogue had Caesar and his throne in high regard more than Yahweh (God). In all respect, the Pharisees needed Caesar’s authority with Roman’s power to continue keeping the high seats over the Jews, which only could happen if they pay tribute and subject to Caesar and Rome. Tertullian within himself, probably cited this verse (2nd Thessalonians 2:7-9), which seemingly pointing to the Emperor or rulers of Imperial Rome. The mystery of Iniquity (wickedness) points to the elders of the synagogue during the time of the Messiah, how they worked hand in hand with the council of Rome and defamed the righteous ones and the true Church set out the by Messiah. Tertullian, however, cited governance of Rome (Imperial Rome) as the restraining force. This restraining force was as an obstacle against the Scribes and Pharisees, who would one-day desires the imperial post.The aspiration grew, and its fulfillment was the Pontifex achievement (crowning) of Pope Damasus. Paul himself had already determined that the angels of darkness dress themselves to appear as “angels of light”. According to Paul’s findings, we could understand then that these “angels of dark” would loot the gospels the Messiah gave unto of the apostles (Corinthians 11:12-15), and turned the truth to fables. It becomes evidence that the man of perdition, Satan’s instrument, had already determined their work, as it resulted in the Messiah’s crucifixion. Rome was an instrument of the enemy (The Dark One), and therefore, it was the best place for the seat of the man of perdition to take residence. At that address, he will decide on his terms as the religious contender. Jerome also considered the Roman Empire as the restraining force, and that the Roman Empire removal was during his tenure. He indicated that the man of lawlessness and the Antichrist was near and about to reveal himself. Jerome warns that Rome and its destruction will start the working of the man of perdition. However, on the other side, destruction of Rome was not in its totality a falling state or falling government, but a switch in its imperial governance to the papacy (Papal Rome). Jerome himself also understands that this Antichrist would be a character out of the Church. In all due respect, such understanding of Jerome would indicate that the man of perdition would manifest himself as christ like, taking the seat of Caesar and rendering glory to his throne. Circa, Augustine of Hippo and Pope Gregory, established their thought on this Antichrist been a man who shall act as one who would be embedded in the Church, whether the temple in Jerusalem or in the Church. Question: – Is this Church the Temple in Jerusalem or the Church at Rome? Nevertheless, the other side of the coin showing the Pontifex Maximus had determined disintegration of the restraining force (Imperial Rome). It was in the hand of Emperor Gratian who reluctantly passes over the title of the Roman goddess to Pope Damasus. This initiates the upbringing and break through for the Antichrist. After Pope Liberius’ death, on the 24 September 366 AD, Pope Damasus won the favour of the people of Rome. This favour granted him the Bishopric after many confrontations between his followers and his opponent. The battle (confrontation) was between supporters of Damasus and loyal supporters of Ursinus who was deacon to Liberius. At the end, the prefects (military people manoeuvring provinces) banished Ursinus sending him to Gaul, and condemned at the Synod of 378 AD. Damasus, after his exoneration, became (pronounce) the true Pope of Rome. After Damasus achievement on the title Pontiff, he established a new Latin version from the old Greek version of the Bible that existed. Actually, all hell broke loose when the newly version indicates the Immaculate Conception-the Virgin Birth. In addition, the Church (Catholic) diverted from Water Baptism (immersion into water) to the sprinkling (Christendom) of water being done. The introductory abomination defamed the real essence of the crucifix, giving encouraging analysis that our redemption and grace came through the Virgin Mary, other than the Messiah’s redemption and grace. “For the mystery of iniquity doth already work: only he who now letteth will, until he be taken out of the way. And with all deceivableness of unrighteousness in them that perish; because they received not the love of the truth, that they might be saved” (2nd Thessalonians 2:7-10). Even Paul, in his virtue, understands the “mystery” of the son of perdition. He (Paul) also cited that they (lawless ones) gave not to the Elohim (God) that is for the Elohim (God), but unto Caesar that counts for a respect and loyalty. “…they received not the love of the truth… but had pleasure in unrighteousness” (KJV) 2 Thessalonians 2:12). Paul, in his words, simply meant that the truth was not in the children of men (heathen) from the beginning, and because of that, they “render unto Caesar” that of El Elohim (God). The title, Pontifex Maximus, held by these dignitaries (including Caesar), gave them the authority to include themselves as godly signet, setting the table for others to discredit the power of the Most High. The seat of Caesar, as with the title “Pontifex Maximus,” intertwined into the House of El Elohim (God), making it equal to the Most High’s purposes and glory, thus underlining Caesar’s glory with the Father, Son and Holy Spirit. Looking into Tertullian argument, which speaks of the “falling” of the ten kingdoms that shall make way for the Antichrist, one could understand that the uprising of the ten kingdoms, is the upbringing of the strength of the man of perdition and the strength of Papal Rome. In fact, the title (Pontifex Maximus) would be of much necessity, giving proof of such authority within the umbrella of such Christendom. “…eleventh king will arise, who will overcome three of the ten kings…the seven other kings will bow to that victor”. In fact, Jerome understands that this Antichrist would be embodied in the Church, and within it, he sat as (a) god. It is of value that even Jerome believed that the Church would be the breeding ground of (for) the man of perdition. Moreover, the work was already in effect, as the Scribes and Pharisees portrayed themselves as an enemy of the council that was (is) call of God. What then, how can they who is call of the Most High, take path in the seat and honorary place of Rome. Would it not be that they too would be under disguise, working for, and in order of the man of perdition? One must understand that all said and done, these ten upcoming kings and elimination of Rome (Imperial Rome) took place during the rebuilding of Papal Rome (Papacy). The lawlessness, iniquity and the hand of the man of perdition took its course, as they give sanction (declaration) to remove that greatness of the “daily sacrifice”, and place the work of the abomination. This act encouraged discord within the gospel, and many divine orders molested and derailed. Rome implemented customs, and as a result of that, the consecrated ceremonies of divine orders demolished. Daniel himself speaks of the truth that was “cast to the ground”, and that was to make void the notions of truth. The Church, under authority of the man of perdition, practise and prosper working signs and wonder, while the souls led astray that had not the love of the Highest. 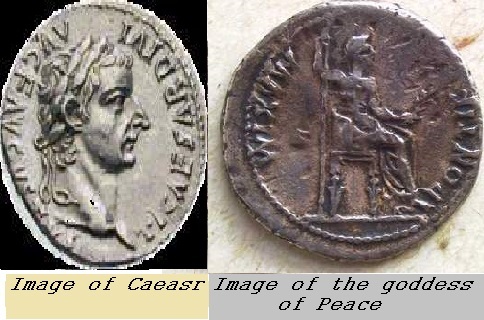 “Give to Caesar (his throne) due to Caesar and to God (His temple) that which is God”. Pingback: RENDER THEREFORE UNTO CAESAR THE THINGS THAT ARE CAESAR’S AND UNTO GOD THE THINGS THAT ARE GOD’S” (MATTHEW 22:22) – PT 5 | My Blog Title is "THE UNVEIL PERSPECTIVE"